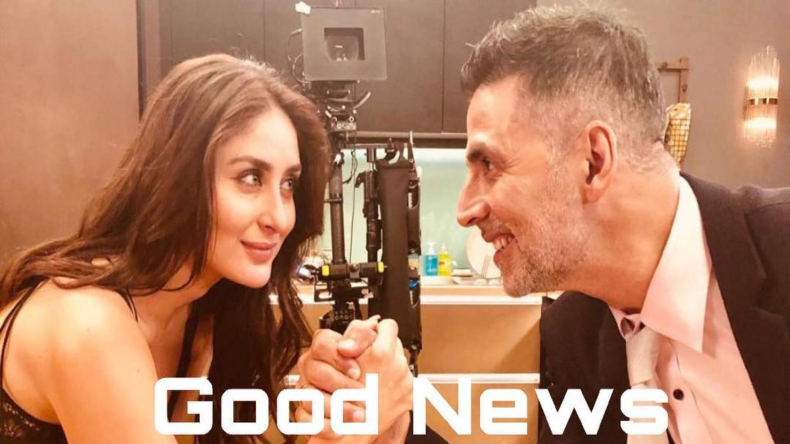 Good News: Bollywood actors Akshay Kumar and Kareena Kapoor Khan will be sharing the screen space in the upcoming film Good News. Co-starring Diljit Dosanjh and Kiara Advani, the film is scheduled to release on September 6. Before Good News, Akshay and Kareena have starred together in films like Aitraaz, Kambakkht Ishq and many more. Bollywood actors Akshay Kumar and Kareena Kapoor Khan are all set to star in the upcoming film Good News. As the duo shoot for the film today, Akshay has shared a photo from the sets calling Kareena his Monday motivation. In the photo shared by Akshay, the actor can be seen dressed in a black suit styled with sunglasses while Kareena is a sight to behold in a blue striped high-low dress. In the other photo doing rounds on social media, the duo can be seen posing for a picture with celebrity makeup artist Mickey Contractor and hairstylist Yianni Tsapatori. Before Good News, Akshay and Kareena have starred in films like Aitraaz, Kambakkht Ishq, Tashan and Ajnabee. It will be interesting to note whether the duo will be able to recreate the on-screen magic once again. Along with Akshay Kumar and Kareena Kapoor Khan, Good News also stars actors like Diljit Dosanjh and Kiara Advani. The duo had started shooting for the film in the month of November. Helmed by Raj Mehta and bankrolled by Karan Johar under the banner of Dharma Productions, Good News is slated for a theatrical release on September 6, 2019. In 2019, Akshay Kumar will also be seen in films like Mission Mangal, Housefull 4 and Kesari. On the other hand, Kareena Kapoor Khan will be seen in the upcoming film Takht. Helmed by Karan Johar, Takht also stars actors like Ranveer Singh, Vicky Kaushal, Alia Bhatt, Janhvi Kapoor, Bhumi Pednekar and Anil Kapoor.